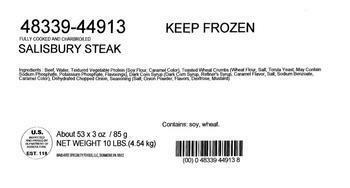 Maid-Rite Specialty Foods of Dunmore, Pa., is recalling approximately 174,000 pounds of various beef products containing milk, an allergen not declared on the label. 30-lb. bulk boxes of “FULLY COOKED BEEF BURGERS,” with case code 83353-52980 and lot numbers 04/04/17, 04/06/17, 04/07/17, 04/10/17, 04/18/17, 04/24/17, 04/25/17, 05/04/17, 05/08/17, 05/15/17 and 05/16/17. 30-lb. bulk boxes of “FULLY COOKED BEEF BURGERS,” with case code 83353-52981 and lot numbers 03/31/17 and 05/08/17. 30-lb. bulk boxes of “FULLY COOKED BEEF BURGERS,” with case code 83353-52982 and lot numbers 03/31/17, and 05/08/17. 10-lb. bulk boxes of “FULLY COOKED AND CHARBROILED SALISBURY STEAK,” with case code 48339-44914 and lot numbers 03/31/17 and 05/08/17. 10-lb. bulk boxes of “OUR HOMESTYLE BIG-N-BEEFY PATTIES,” with case code 70804-35001 and lot numbers 03/20/17 and 04/19/17. 10-lb. bulk boxes of “OUR HOMESTYLE BIG-N-BEEFY PATTIES,” with case code 70804-35005 03/20/17, 03/31/17, 04/19/17, 05/02/17, 05/05/17, and 05/19/17. 30-lb. bulk boxes of “FULLY COOKED BEEF MEATBALLS,” with case code 75156-33530with lot codes 03/13/17 and 04/28/17. 10-lb. bulk boxes of “FULLY COOKED BEEF STEAKETTE FOR SALISBURY,” with case code 75156-34914 and lot number 04/27/17. 10-lb. bulk boxes of “FULLY COOKED AND CHARBROILED SALISBURY STEAK,” with case code 48339-44913 and lot numbers 03/16/17, 03/28/17, 04/18/17, 05/08/17, and 05/17/17. The recalled products, bearing establishment number “EST. 77” or “EST. 118” inside the USDA mark of inspection, were shipped to institutional locations throughout the U.S. and Canada. Customers who purchased the recalled products should not consume them, but throw them away or returned them to the place of purchase. Consumers with questions about the recall may contact Kurt Sorensen or Deb Weber at (570) 343-4748.